Is freedom of choice an illusion? Despite the amount of choices in the consumer market, several big companies own a large majority of major brands, effectively controlling everything you buy. So, how much of “choice” is really controlled by big business, and how well do Americans understand which corporations have a stake in the goods and services they rely on every day? 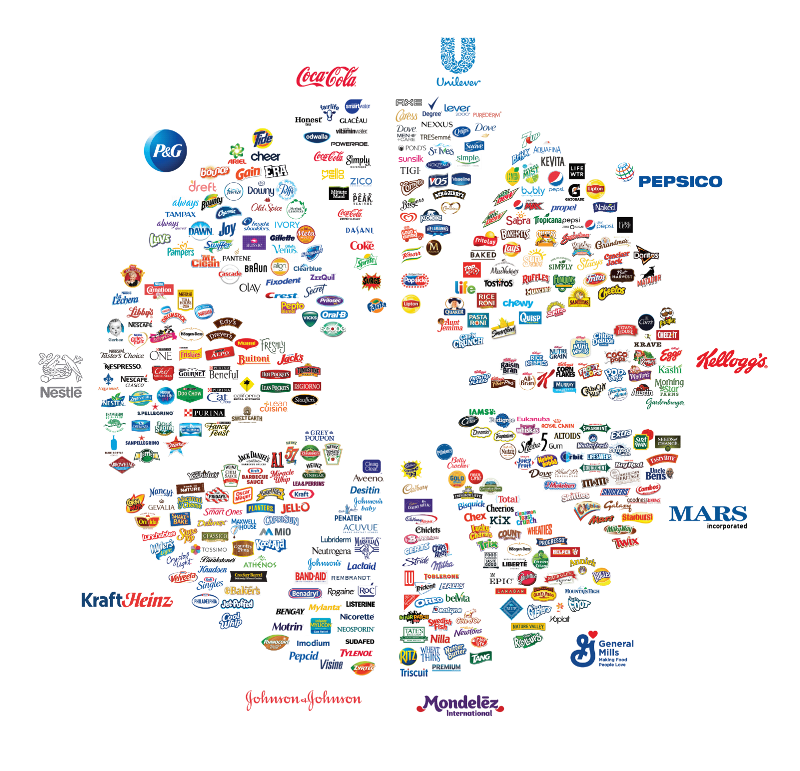 To find out, we took an in-depth look at the major companies that own a majority of America’s food and consumer goods. Then, we surveyed 3,000 Americans about their understanding of which big businesses own which major brands. Check out our full visual below, or skip ahead to see our survey findings. Ceiling-high grocery store shelves may give the perception of endless options, but a closer look at the brands and the companies that own them reveal a complex interconnection. Check out our full visual above to get a better sense of just how intertwined some brands are, and read on to learn more about how well Americans understand this relationship. Do Americans Know Which Major Companies Own Which Brands? To get a better sense of whether Americans understand how the products they buy are influenced by big business, we surveyed 3,000 people about the different brands and their owners. Americans can’t correctly identify the owners of major brands. The majority of Americans were unable to choose the correct owner for each brand in every instance. Half of Americans are influenced by organic-sounding companies. Nearly half of respondents believed that Annie’s Homegrown and Kashi were owned by companies with organic/health-focused names. 54% of Americans think Honest Tea is owned by a tea company. 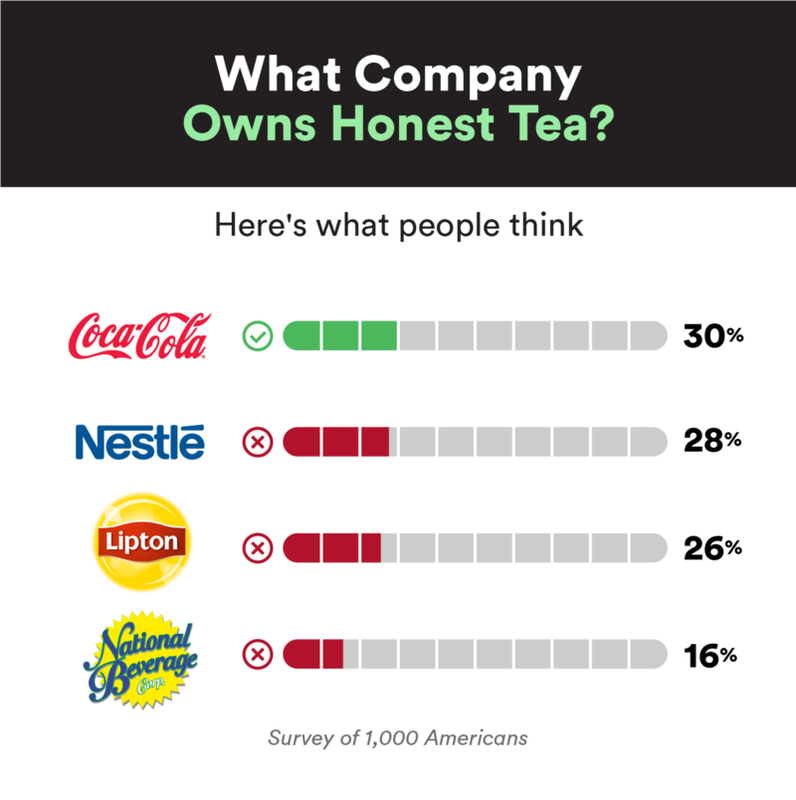 A combined 54% of respondents chose Nestle or Lipton as the owner of Honest Tea, a Coca-Cola beverage. Across the board, Americans were unable to correctly identify the correct owners of major brands. Respondents came closest with Kashi, which 48 percent correctly identified as owned by Kellogg’s. 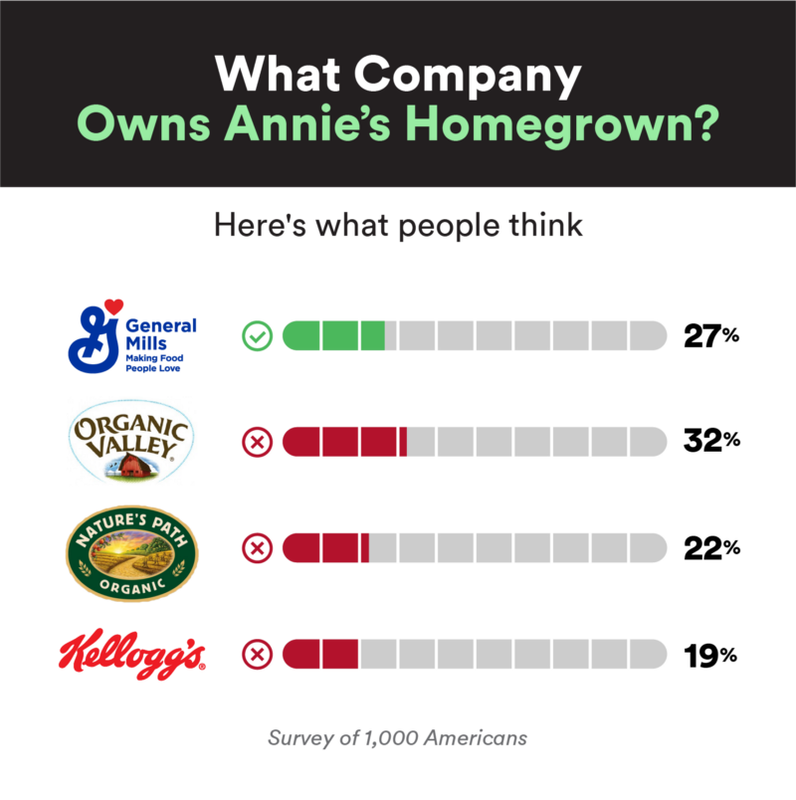 Only 30 percent of respondents selected Coca-Cola as the correct owner of Honest Tea, and just 27 percent of respondents correctly chose General Mills as the owner of Annie’s Homegrown. In a result that shows the power of marketing, our study found that the majority of consumers believe brands marketed as health-conscious are owned by companies with a healthy or organic-sounding name. For example, a combined 54 percent of Americans believe that Annie’s Homegrown, which touts itself as selling “nourishing foods that are good for the planet,” is owned by either Organic Valley (32 percent) or Nature’s Path (22 percent). Neither Organic Valley or Nature’s Path are run by conventional food companies: Organic Valley is comprised of an independent cooperative of organic farmers and Nature’s Path is family owned. Annie’s, however, is owned by food company General Mills, a fact that only 27 percent of respondents correctly identified. 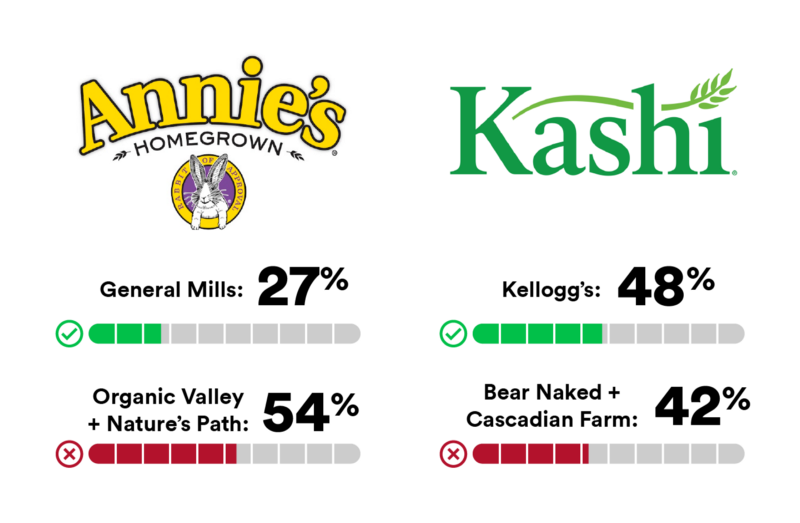 Similarly, a combined 42 percent of Americans think Kashi, a food brand that promotes “simple, natural ingredients,” is owned by either Bear Naked (a granola brand owned by Kellogg’s) or Cascadian Farm (an organic brand owned by General Mills). 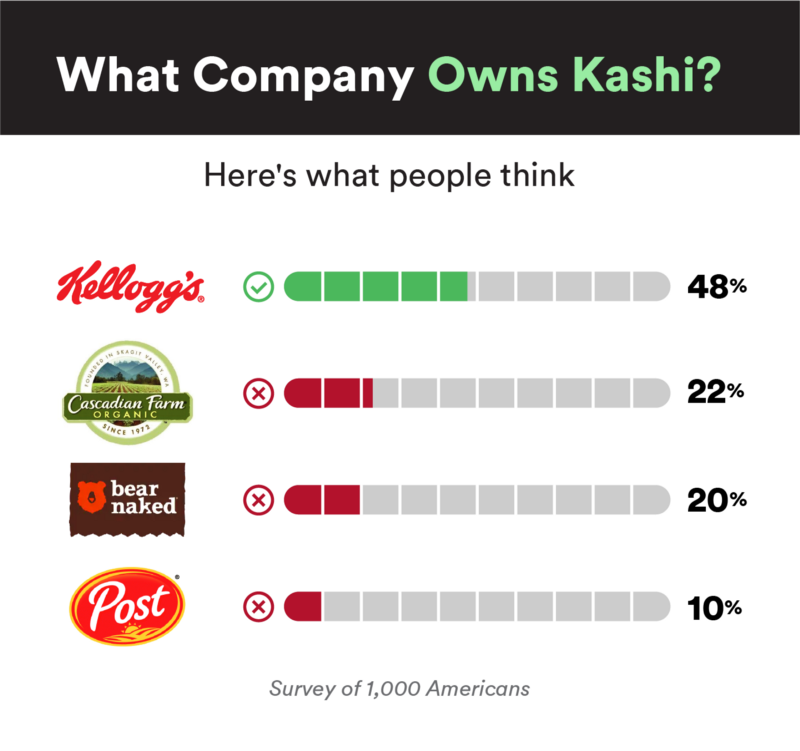 A little less than half of respondents, 48 percent, correctly identified Kellogg’s as the owner of the Kashi brand. A combined 54 percent of respondents believe that Honest Tea, which describes itself as offering “truly healthy, organic beverages,” is owned by a tea company. Nestle, owner of Nestea, was chosen by 28 percent of respondents and Lipton, a British brand of tea owned by Unilever, was chosen by 26 percent. Only 30 percent of respondents correctly chose the Coca-Cola company as the brand’s owner. Consumer goods brands aren’t the only ones controlled by major companies. There are a number of industries where major conglomerates own various brands, from media and movies studios to high-end beauty and luxury fashion. 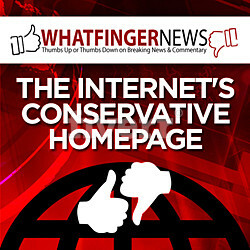 So, do American consumers really have freedom of choice? 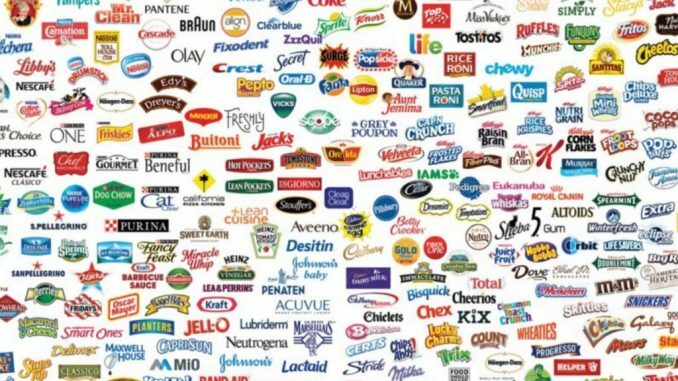 With 11 billion-dollar consumer good and food companies controlling over 400 major brands, we may not have that many choices — but we certainly have the illusion of them.